Nichole Riddle is a communications intern with North Carolina Sea Grant. She is a senior at North Carolina State University. In a world of minute-by-minute status updates, an invasive aquatic plant that’s been in North Carolina for more than 30 years seems like old news. But experts caution against casual dismissal. “When we think about a plant like Hydrilla in some of our coastal systems — and what those coastal systems mean to the state of North Carolina — there could be some major, major problems and impacts,” says Brett Hartis, an aquatic weed scientist who earned his doctorate at North Carolina State University. “Hydrilla” can be hard to identify and even more difficult to remove. Photo by NC State Dept of Crop Science. Last year, in an effort to understand the extent of this plant’s spread, Gloria Putnam, North Carolina Sea Grant coastal resources and communities specialist, led a collaborative effort with help from the Chowan Edenton Environment Group, or CEEG, and the Chowan Soil and Water Conservation District to sample the Chowan River near Edenton where Hydrilla has moved from nearby creeks into the river channel and sound. Twelve volunteers from Chowan County assisted with sampling sites from Holiday Island to the N.C. 32 bridge that crosses the Albemarle Sound. While efforts focused on the Chowan County side of the river, some data were collected from Bertie County. After more than 60 hours surveying on the water, and many more hours training volunteers and adapting software that could work reliably in such a remote area, Putnam and the citizen scientists had collected data from 366 points. Invasive Hydrilla was found at 77 locations, scattered along almost the entire length of the sampling area. See the maps on page 37. She hopes to learn a little more about how far Hydrilla has extended its reach. This year, she plans to expand the sampling area farther up the Chowan River near the Virginia border and deeper into the Albemarle Sound. Edenton and Chowan County are one of the “first coastal regions to be outspoken about Hydrilla,” says Marie English, a special projects associate with the Albemarle-Pamlico National Estuary Partnership, which is within the North Carolina Department of Environment and Natural Resources. And what they do might affect how the state treats Hydrilla in the future. “It could set a precedent,” she notes. Hydrilla verticillata, sometimes called waterthyme, is considered an invasive, noxious weed at both the federal level and in North Carolina, as well as in 16 other states. Invasive species thrive in places that are not their native habitat. A noxious weed is one that is recognized to harm the area it is in — economically, ecologically or in some other way. Hydrilla was brought to the U.S. for use in aquariums. Once it began spreading in waterways, however, problems quickly followed. Some issues, such as hindering boat access to the water or making swimming more difficult, were obvious. Other problems — such as altering water flow, and changing the population and individual sizes of fish — can take a longer time to develop. Hydrilla is not easy to eradicate. First, people have to learn how to properly identify the plant before they can treat it. Hydrilla has taken a foothold in our state partly because of its close resemblance to Elodea canadensis, a native aquatic plant, and the invasive Egeria densa. Another concern is how easily the fertile plant can spread. It is “one of the worst of the worst,” explains Hartis, who now works with the Tennessee Valley Authority. Hydrilla produces seeds and tubers, which can sprout into new plants up to seven years later. It also can reproduce from fragmentation. The plant can grow in water as deep as 20 feet and, in lab experiments, in salinity as high as 18 parts per thousand — the salinity level in many of North Carolina’s sounds and estuaries. 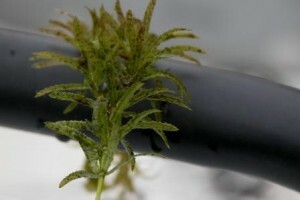 The plant is easily spread through boats and trailers that are not properly cleaned. Photo by Rob Emens. Treatment goes hand-in-hand with knowing how far the plant has spread and in what areas it’s located. A downstream treatment won’t be as effective if there’s an infestation farther up the river. And getting the right concentration of herbicide can be difficult in an area where the water flows quickly. That’s why the surveying work is so important. “Chowan County can use the information to help them make management decisions regarding treatment,” says Putnam, who also serves on the Mid-Atlantic Panel on Aquatic Invasive Species. 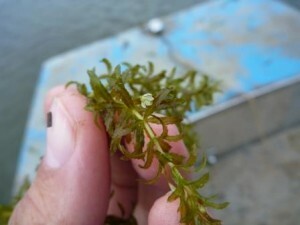 Deciding who will pay to treat Hydrilla can be problematic, English points out. State and local governments, as well as citizens, have numerous priorities for limited funds and resources. When does Hydrilla top that list? All of these challenges often come back to one key issue: awareness. 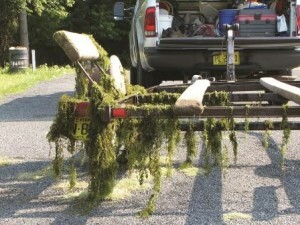 Treatment won’t help if people are unaware of the problem and continue transporting Hydrilla into new areas for what they perceive to be beneficial reasons — or unwittingly do so via contaminated boats and trailers. Some people like the plant because it can attract waterfowl or assist with seasonal migrations. A potential problem, however, is Avian Vacuolar Myelinopathy, or AVM. It is a disease that causes lesions on the brains of birds that consume a neurotoxin-producing type of cyanobacteria that can grow on the underside of Hydrilla leaves. Lesions also have been found in dead bald eagles, which acquire the neurotoxin indirectly after they consume other infected birds. This danger to bald eagles is especially relevant to North Carolina because Jordan Lake, in Chatham County, is home to one of the largest concentration of bald eagles in the eastern United States. Susan Wilde with the University of Georgia’s School of Forestry and Natural Resources has been studying AVM and its potential connection to Hydrilla. Her website, www.warnell.uga.edu/people/faculty/dr-susan-wilde, has several links where observers can report sick or dead bald eagles and other waterbirds, or send in samples of plants to be screened for the cyanobacteria. North Carolina officials are drafting an Aquatic Nuisance Species Plan that will address Hydrilla and other problematic species affecting our waterways. The plan is “an overview on the history of the problem, existing policies and programs, identification of freshwater and marine aquatic nuisance species and potential threats, and recommendations about management strategies and research needs,” explains Judy Francis, with N.C. DENR in Asheville. The recently named “Aetokthonos hydrillicola,” which hides on the underside of “Hydrilla” leaves, can cause a disease in birds. Photo by Susan Wilde. The plan currently is in review. It is expected to be available for public comment this spring. Separately, the N.C. Division of Water Resource’s Aquatic Weed Control Program within DENR also has been at work the past several years treating Hydrilla at many locations across the state. Once the species has been identified in an area, specific spots are selected for treatment and must be periodically revisited. Treatment varies by location, with biological, chemical, mechanical and physical methods available. All methods require careful consideration and monitoring. A physical method, like lowering the water level, will effectively dry out any submerged Hydrilla, as well as any other plant that also is in the water. A mechanical method, like a rake or some other type of tool, greatly increases the risk of spread by fragmentation. North Carolina primarily uses chemical and biological methods to control Hydrilla. There are several different herbicides the state can use, with some being more suitable in certain areas. Some that are more selective of the plants they kill may work more slowly. Others may work faster, but be less selective. Location factors, such as proximity to seafood nurseries or flowing water, must be taken into consideration. In all cases, the herbicides must be ones approved for aquatic use. The timing of an aquatic herbicide application also must be planned responsibly, so as not to negatively impact the reproduction of local aquatic species. Use of grass carp as treatment presents its own unique challenge as the fish also are not a native species. They are primarily used to eat away Hydrilla in enclosed water with lower salinity, such as reservoirs. Students at John A. Holmes High School in Edenton are doing their part to raise awareness about Hydrilla. What started as something to do during a free period at school has turned into a project that is making a difference in their community, while allowing the students to learn some valuable skills. Science teacher Steve Karl participated in the survey of the Chowan River with Putnam and the CEEG last summer. The students began to get involved when Karl became aware of several grant opportunities. Having that interest paid off. The students won $2,000 from the What Kids Can Do grant and $1,000 from NC State’s Institute for Emerging Issues Youth Innovation Grant. They plan to use the grant money to raise awareness with signs and surveys, to design a rake to clean off boat axles, and to provide composting barrels for Hydrilla. The students’ efforts already are paying off. They were invited to the Edenton-Chowan Board of Education meeting in March. They also will attend a local homeowner’s association meeting and present at the annual meeting of the North Carolina Invasive Plant Council in May. Steve Karl hopes that the success the students have had will inspire others. The students emphasize that prevention is better, and easier, than treatment. Cleaning off boats when leaving the water is a good start. To help spread the word that Hydrilla is in coastal waters, North Carolina Sea Grant, along with the Albemarle-Pamlico National Estuary Partnership, North Carolina State University’s Department of Crop Science and Chowan County, developed a pair of videos to raise awareness about Hydrilla verticillata. They detail the plant’s history and impacts to our state. Interviews include citizens, managers and scientists. “Use these videos in classrooms and community programs to educate students and citizens about Hydrilla,” suggests Gloria Putnam, Sea Grant coastal resources and communities specialist. Visit ncseagrant.ncsu.edu/hydrilla to view the videos, and find other Hydrilla-related resources. Get involved and fight Hydrilla verticillata. Check with your town to see if it is seeking volunteers to help with its own Hydrilla collection or research projects. Gloria Putnam, North Carolina Sea Grant coastal resources and communities specialist, is planning a volunteer-training event this summer in Edenton. Contact her at gloria_putnam@ncsu.edu for details. Even if you cannot attend, you can request that Putnam add you to her mailing list so you can be notified of future events closer to you. Here are some resources to help you identify and eradicate Hydrilla. Download the free app from NC State University’s Aquatic Plant Management website to help identify common aquatic plants: www.weedscience.ncsu.edu/aquaticweeds/. Use iNaturalist, another free app, to take a picture of a plant or organism and upload it to a database. If you don’t know what you are seeing, other users can potentially identify it for you: www.inaturalist.org/. Step up and start something in your own community. Like the high-school students in Edenton, seek out grant opportunities to help you get started. This article was published in the Spring 2015 issue of Coastwatch.